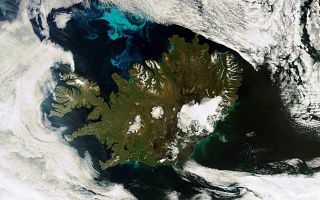 This Envisat image shows us a very rare, cloud-free view of Iceland. This image was acquired on July 21, 2010. In this space wallpaper, an Envisat image shows us a very rare, cloud-free view of Iceland. The large, white area is a national park that encompasses the Vatna Glacier – Europe’s largest – and surrounding land. The white circular patch in the centre of the country is Hofsjokull, the country’s third largest glacier and its largest active volcano. The elongated white area west of Hofsjokull is Langjokull, Iceland’s second largest glacier. In the surrounding water, blue and green swirls of phytoplankton are visible. This image was acquired on July 21, 2010 by Envisat's Medium Resolution Imaging Spectrometer (MERIS).